Question-Answer allows a user to ask what an object is and receive an answer via Twitter. Google Glass is a revolutionary piece of technology that has endless capabilities, and the development team at OpenGlass are working on a project that aims to aid visually impaired people in their day-to-day lives. OpenGlass published a video demonstrating two innovative applications for Glass; one is based on a simple Question-Answer script which allows the user to ask what an object is and receive an answer via a social network. The other, which is called Memento, enables Glass to act as a virtual reality device, dictating what it see’s to its user. 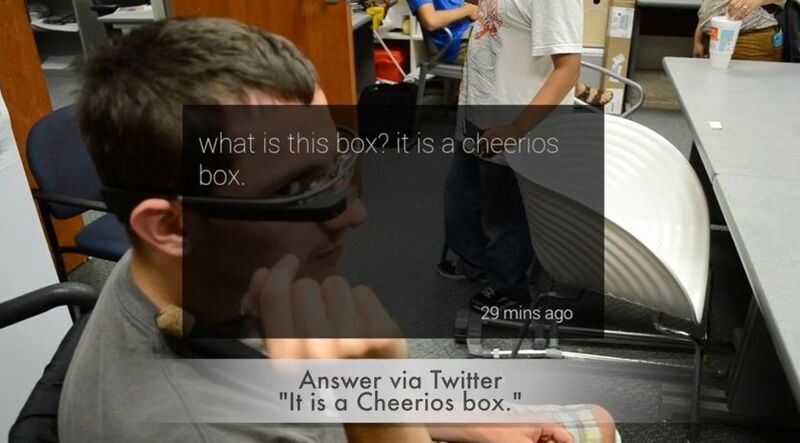 The Question-to-Answer program enables a visually impaired user to take a picture using Glass and tweet it to a dedicated OpenGlass Twitter account, where one of their cloud workers will read and respond to the tweet. The response will contain a simple answer identifying the object and informing the user what it is they have taken an image of, the answer is then relayed out loud through Glass’ internal bone conductive speaker. Memento is a real-time reality app that streams real-time video frames into an electronic cluster, which then matches an image to a dataset of known images and annotations created by a sighted user. Once Memento has been fully configured by a sighted person, it is then passed back to a visually impaired user where annotations associated with matching images are retrieved from the dataset and read aloud – again through Glass’ internal bone conductive speaker – effectively describing to the user what Glass is seeing. The demo video entitled “Testing OpenGlass with Visually Impaired Users” can be watched below. In the video above you will see a demonstration, in which Glass tells the visually impaired user that they are looking at a laser cutter and as the user gets closer to the machinery he is warned to take care. The software that OpenGlass has developed is truly amazing and could potentially help many visually impaired users both now and in the future.